Does talking or singing to plants really help them grow? Lots of people do it, and some insist that it helps, but is there evidence to support this? Let’s have a look. This is part of a new series exploring popular garden myths and unusual advice. Do Plants Grow Better When We Say Nice Things to Them? 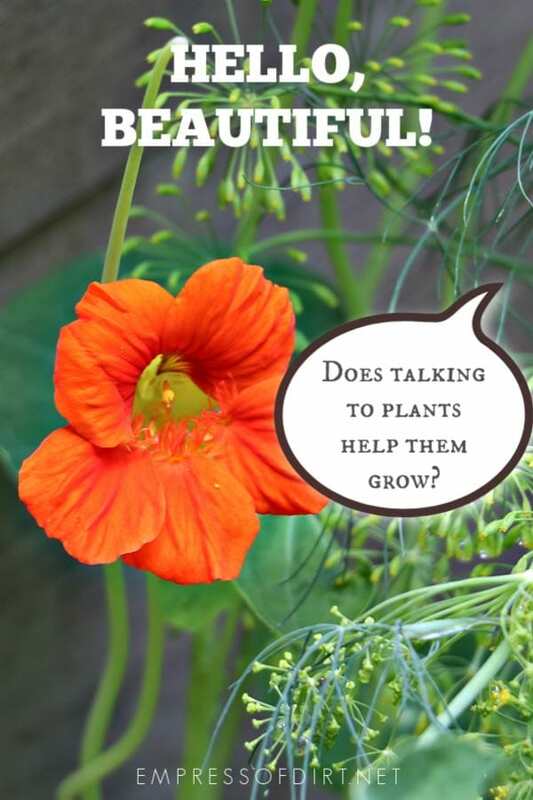 We’ve been hearing this stuff for years: that plants grow better when we talk to them in a kind and encouraging manner. Have a look at this 2018 Ikea ad that plays on this idea. Yes, it’s a heartwarming anti-bullying message, but is that part about the two plants growing so differently true? Talking to plants, as well as other non-human beings and inanimate objects is not unusual. Many of us do this. I know I talk to the birds at the feeder and the plants in my garden. I also feel the impulse to hug and talk to big, old trees. My husband greets the treadmill each day before his run. And while normal to us, it’s quite a leap to think it also spurs the growth of plants. So, we looked into this “proof” and it turns out it was from a publicity event that the RHS ran nearly 10 years ago where they recorded different voices and played one each to various tomato plants. They did this by putting headphones around the plastic pots of tomatoes. They held auditions and had Charles Darwin’s great-great-granddaughter reading from “On the Origin of Species”. At the end of the month, they compared growth measurements and declared that Sarah Darwin’s plant grew the most and that two that weren’t given voices had a slower rate of growth. It sounds like a perfectly fun event (and not intended as a true experiment) to raise the profile of the RHS, and that’s what it was. As far as I can tell, no one in the 9-plus years since this event has successfully replicated these findings under a more rigorous experimental design. Going back to the IKEA ad, while it may provide the feel-good anti-bullying message they hope to spread, we have no evidence to support it. And, does any rational person really believe those drastic results? As a houseplant grower, it seems clear that they either swapped out plants to (misleadingly) illustrate their point, or, there were significant differences in the actual physical care and growing conditions (light, water, humidity, temperature). To be completely cynical, there could have also put something in the soil of the bullied plant to gradually kill it off. But a sad, wilted plant from some mean words? No. Here’s one last bid to support IKEA’s idea. Some have argued that you exhale carbon dioxide as you talk, and CO2 is good for plants—that’s true—so maybe the C02 helped. Except, you exhale CO2 whether you’re talking or not, so there would be C02 present no matter what. Plus, the plants ‘listened’ to voice recordings anyways, so no extra human exhaling was involved. So, sorry, IKEA, we’re not believing you. With countless examples of how bullying hurts, do we really need to make this stuff up and mislead people about science in the process? It isn’t impossible that some plants have a beneficial response to sound waves in a talking voice, but no one’s ever shown this. Lack of evidence aside, if a daily conversation with a chipmunk or a freshly-blooming flower seems as natural and necessary to you as it does to me, your well-being is reason enough to keep it up. And, if you want healthy plants, say what you like while providing proper care. Are Epsom salts really good for the garden? Some years ago, there was a TV program called ‘Mythbusters’. They did try this in a very comprehensive and detailed experiment. Because of what they did and how they did it, I thought the results were very surprising! !